I forgot to mention this with Paul's news about sectionals. Jimmy got a job at the sandwich place! He came home and I had to ASK him how it went. He was hesitant so I thought he didn't get a job offer. But not so. His hesitation comes from breaking out of his comfort zone and doing something different. He is a little nervous about it. He'll start training and then when he works, he'll be on a 30-day trial period. He asked me if he'll get paid during the probation and I assured him that he would. And another thing I forgot to mention. 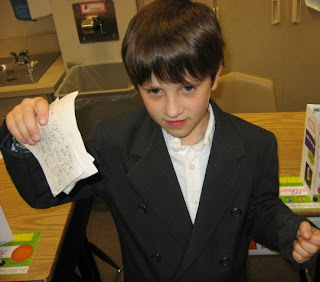 Today I went to Matt's wax museum and saw his presentation on Wilbur Wright. He did a fine job! 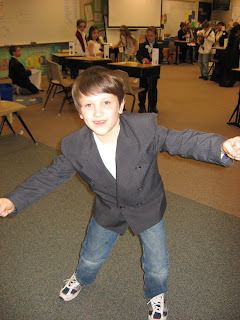 Matt, as a non-moving Wilbur Wright. 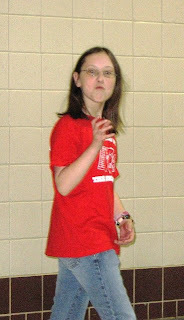 Then afterwards, I wandered into the gym where the 5th graders were going to start their music program. I had told Hayley that I didn't think I would be able to see her program and she told me that she didn't mind. In fact, she assured me several times, "It's fine if you don't go." But I stayed to see the program. AND HAYLEY HAD A SINGING SOLO. She purposely didn't tell me! Her friend told me that she didn't want to be embarrassed in front of me! :( Anyway, I'm glad I went. She sang a verse of "We are the World" and did a fine job. Here she is, seemingly upset that I'm there in the audience. Afterwards, I went to find her to tell her that she did a good job, and she wouldn't look at me. I gave her a smooch anyway. And this evening, she had a couple friends over for fun and s'mores. We kept the fire going for 3 hours--two hours after her friends went home. I think they had a good time. Way to sing, Hayley. I guess you have another one to follow in Katie's footsteps and start that whole thing all over!! awww, he looks like he really got into the wax museum thing. what a cute idea. and way to go Hayley. I didn't think she had it in her to sing a solo (she's so shy and quiet).